In the past, we’ve blogged the proper use and application of Variable Speed Limit Signs on U.S. highways as it pertains to use relative to either traffic or weather conditions. Highlighted were typical designs and regulations with options regulatory agencies employ in color and size of the overall sign, both for the static and the LED aspect of the sign. In the majority of applications however, typical 12 or 18” characters employed fall short of MUTCD full compliance. Where is this adaptation? It’s in the LED design or rather, the LED design the agency may opt to use. To follow the compliancy aspect of true character compliance in the LED sign the matrix design to meet the font design can’t be done in typical VMS 66mm pixel pitch, nor in any pixel pitch greater than 32mm. 32 mm pixel pitch is in fact, ideal when truly matching the static sign font thus conserving costs over a sign with a smaller pitch say, in 20mm with color LEDs. Think back through any images you may have seen of highway variable speed signs. Did the LED sign really match the static portion or was it more similar to what you would see on a dynamic message sign? Was it uniform or so perfectly matched you could not discern the difference? Chances are, what you have seen is a compromise and in fact, without some sort of federal exemption, is an advisory sign, non-enforceable regulatory application. To properly build a MUTCD compliant VSL sign the colors need to be solid and reliable regardless of angle or distance. The only way to do it is with true white LEDs. Due to the convenience and lack of technology investment, red/green/blue LED combinations are often used. At face value, seems appropriately fine but there is a tint of “dirty white” and add an obtuse angle or see the sign at somewhat the last second upon passing and you catch some blue, green, or yellow undertones. With viewing cone of vision standard at 30 degrees, these color options can fail near the edge of the cone of vision without proper distance away. In two parallel lanes this could be accentuated to the lane furthest from the sign. Most VSLs in place today do not exactly comply with MUTCD requirement because the LED display does not reproduce the graphics similar to the static signs. The static part of the VSL complies because manufacturers build exactly to the MUTCD requirements. 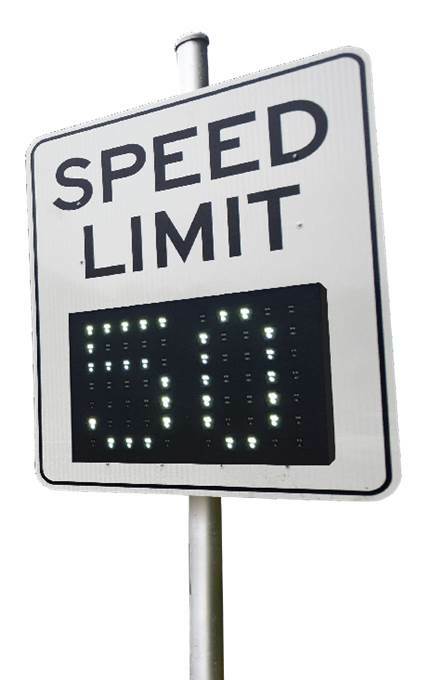 However, they often use the same display capacity that regular VMS utilize at 12” and 18” which may not be in proportion to the MUTCD standards. As regulatory signs, there is vulnerability for enforcement if in fact the design standards are not met. It has been surmised by multiple state agencies, regulatory VSLs are at their optimum value only if enforced by local law jurisdictions. Compromise with the design, you lessen the enforcement creditability. In addition to the above points on color and font design in accomplishing true MUTCD compliance and their enforcement, here a few other simple guidelines to keep in mind. Controller use: a controller can manage multiple locations given the appropriate communication devices are employed. Good example, opposite signs of the roadway with access underground or via radio. A good controller will also employ web-based software. This will enable ITS technicians and even law enforcement to view the signs remotely as well as manage diagnostics and maintenance, when needed. Given the authority, law enforcement could post speeds on an immediate or emergency basis. Ventilation: proper design eliminates the need for cooling systems, thus reducing first costs and eliminating all maintenance costs on a cooling system. In this technology era, cooling systems are considered primitive. Think to the laptop computer. Does yours have a noisy, vibrating fan? Summarily, to further the VSL conversation for use and deployment, there are a number of basic elements for compliant design. For absolute surety, MUTCD compliance with character design and true color utilizing equipment advantages in the marketplace will assist in further compliance and ultimately, obeyed recognition for the driver and less complicated enforcement of the law for public safety agencies on regulatory applications. Employing proper locational placement, ITS-only controllers with Web based software, and no ventilation systems design will enhance the overall use and lower maintenance lifespan. SES America offers a variety of VSL systems covering the entire possibilities, from white to amber and full color displays. We can apply our standard character display boards to create the desired matrix while incorporating a slim, low weight housing to mount on a static sign. Or, should versatility and consistency of image be of importance, a full matrix DMS in higher resolutions and degree of clarity. SES America has pioneered specific designs for VSL signs which perfectly reproduce the MUTCD character design. Whether a DOT professional, engineer, consultant, or contractor, our consultants are available with pragmatic, innovative options possessing deeply progressive SESA industry-leading features in energy efficiency, maintenance software, custom design and excellent customer service.